Welcome to the dog days of summer. When we kick off our shoes at every possible opportunity, the sun starts to dip below the horizon just a moment earlier every night (but we’re in total denial about it), and the every night is BBQ night. Nothing complements a fire-cooked meal like a drink so cold its condensation drips down your palm and into your lap – but in the heat, you barely notice. 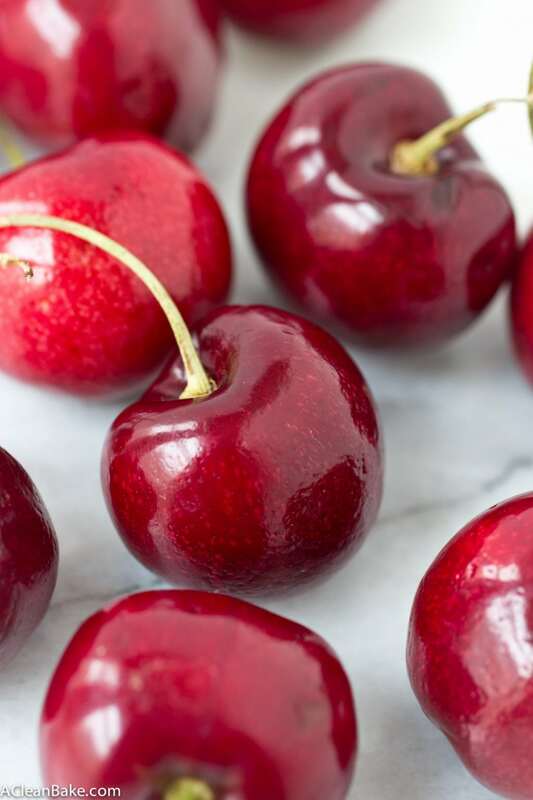 This is also the time of year, luckily, when the cherry harvest is in full force and everywhere you look in grocery stores and farmers markets, there is a pile of them. 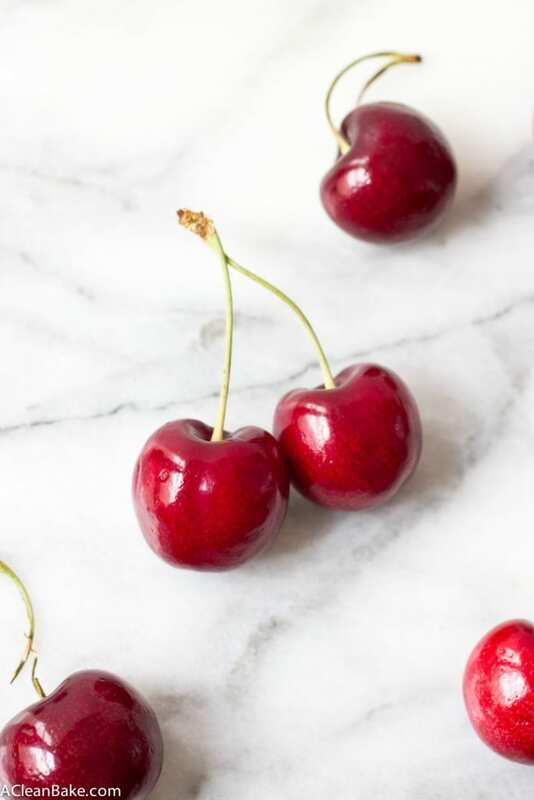 I don’t know about you, but it always feels like I’ve struck oil in my backyard whenever I see a display of plump, juicy summer cherries. (Can you imagine my glee when I actually got to pick them? I’m actually surprised that Bryan still wants to be seen with me after that day). Summer finally came to Chicago, thank goodness, a few weeks ago, and that means taking advantage of every excuse to go outside and soak up the sun (She says while sitting in a dark room with the shade drawn staring at a computer screen. Who doesn’t love a little irony? ), preferably with a drink in your hand. My favorite part about this drink is that it’s just as good with alcohol as without. Or, if you’re like me, with just a tiny splash. Hi, I’m a lightweight. Other than that, everything you need is as straightforward as it gets: bottled sweet cherry juice (preferably unsweetened; look for nothing but cherry juice in the ingredient list), whole pitted cherries (I used fresh, but I’ll bet frozen would work just as well), fresh lime juice, a blender and of course, vodka. If you’re extremely sensitive to vodka, I’d recommend springing for one of the more premium varieties that are gluten free, since they’re made from corn, potatoes or grapes. My favorite is Tito’s, but if you can’t find that, Smirnoff is more widely available. In case you’re curious, here is the full list. You can also, of course, use a different liquor like rum, or skip the booze altogether. It’s still just as delicious, refreshing and summery either way. Naturally Sweetened Cherry Lime Vodka Slushie - because delicious cocktails shouldn't be full of sugar and artificial ingredients! 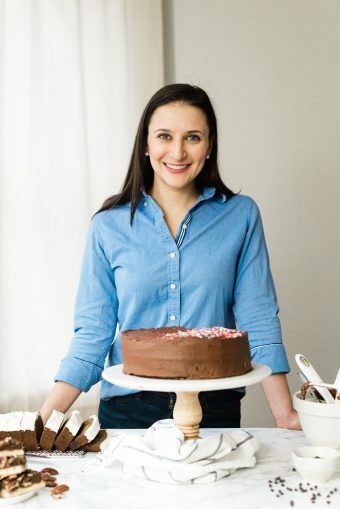 Add the ice to a high speed blender, preferably with an ice crush (or equivalent) setting. Pulse several times to puree the ice, transfer crushed ice to a glass. 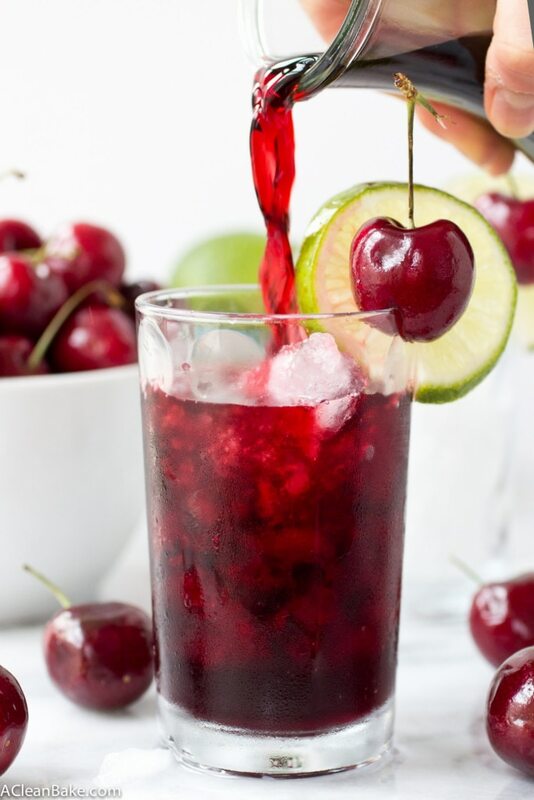 Pour the cherry mixture over the ice and garnish the glass with lime slices and fresh cherries (optional). Replace the honey with maple syrup or agave for vegan or FODMAP diet compliance. To prep this drink in advance, crush the ice and store it, in the serving glass, in the freezer until ready to serve. Blend the remaining ingredients and store them in the refrigerator until ready to serve. 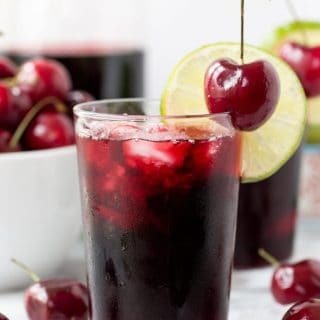 To make a virgin version, skip the vodka and add one additional shot of cherry juice. To make a more snow cone-like slushie, freeze the cherry juice mixture + 1/3 cup water in ice cube trays, then run them through a high speed blender to create "snow". Yield: One serving. Multiply as necessary. 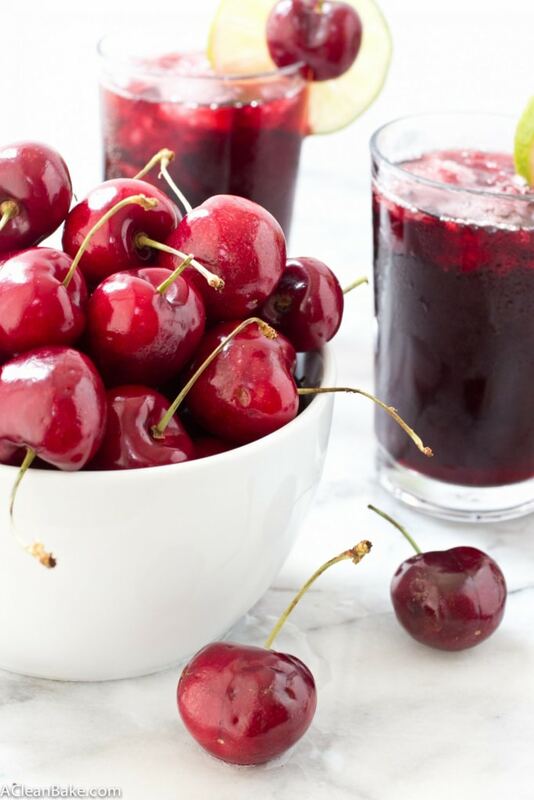 This is the type of cocktail I could put on repeat – I love simple, refreshing bevvies that include zero refined sugar and I’m loving your cherry juice idea here. So pretty and tasty! Nora, I have done my fair share of shades drawn room sitting this summer so I feel you 🙂 This slushie looks so refreshing and I love that it has cherries and lime–that is the perfect slushie combo! Well at least you have a great (and adorable) reason! I hope you are catching some naps in those dark rooms. FYI this drink is just as delicious without the vodka! Look at that pour shot! I want to grab that drink and enjoy it while louging around on this hot day! Hooray for Cherries and their abundance! Oh yesss…. the days are getting shorter, but there’s still summer to be had! I’m loving this sipper, Nora! It’s perfect right now. And cherries? What’s not to love! Thank you for this my dear! You’re welcome, Traci! I couldn’t agree more – let’s enjoy the rest of summer while it lasts!! Ahh the photos here looks beautiful! 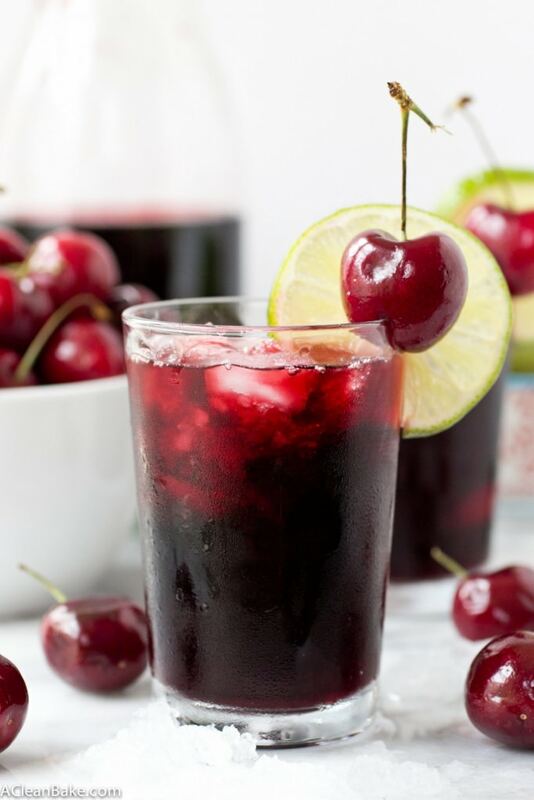 A totally refreshing, bright red splash of summer; makes me giddy just looking at the drink and thinking about all the cherries (: Well done! What a great ingredient to have around on a regular basis! It is kind of my weakness 🙂 I am so glad you stumbled upon the site too. Welcome!! Oh Nora. . .looking at this is making me so thirsty. Sadly the last two times I have ventured to the grocery store, cherries were no where to be seen. As much as I hate to admit it. . .I think cherry season is a distant memory in my neck of the woods. But I will continue to scour the markets for these ruby beauties as I need a sip of this (and my morning ritual of yogurt topped with poached cherries). Don’t worry, Lynne, you can use frozen cherries instead! I have been having trouble finding them lately, too, even though they were abundant a couple of weeks ago when I made this drink. I want to be a lush for this slush! Haha! That can be arranged! Your photography is just so … I can’t even. Those cherries look incredible. And then that slush! Sonic is my kryptonite and being able to avoid the sugar crash – yes please! Wow, thank you!! I have never had the Sonic version to be honest (or, actually, been to Sonic) but I hope this lives up to it! Hope you’re having a great first week(s) at college! This looks so refreshing – what a perfect beverage for the dog days of summer! And yes, I’m totally in denial about the nights getting shorter. Gorgeous photos too – just stunning!